A haphazard mass, a chaotic carnival, a Bikini Atoll, of links relating to economic history, political economy, and allied matters. I also have brief comments on some of the links. I just decided to start doing this, so I am going to do a link-dump of stuff I found interesting in the last couple of months, to the extent that I can remember having found them in the last couple of months. Note : I am not necessarily endorsing the content. I include them because I find them worth reading. The links in bold are the ones I’m highlighting. Diane Coyle has put up a page full of economics books forthcoming in 2015. One of them, British Economic Growth 1270-1870, I already have in hand and I may review it at some point. Readers of this blog know that I don’t put too much stock in Broadberry’s GDP estimates, but the book definitely contains many virtues. Another book I just got is unfortunately so far in Spanish only : El Fin de la Confusión, about the 200 years of “errors which have impeded the development of Mexico”. I read Spanish but rather slowly, so I haven’t gotten to it yet, but according to the description, it promises to be the offspring of Daron-Acemoglu-with-Deirdre-McCloskey. Macario Schettino, a well-known analyst in Mexico, sort of combines the functions of Robert Samuelsen, Dave Warsh, and Martin Wolf. Anton Howes proposes a WikiErrata for sloppy or otherwise bad citations in scholarship. Speaking of which, Jo Guldi and David Armitage, authors of The History Manifesto, affirmed at Columbia University, “The History Manifesto is not an attack on microhistory. It is an attack on the discipline of economics!” (See 15:20 in the video.) Less than a week later at the Harvard Book Store, they reaffirmed, “Enemies we’re shooting against in The History Manifesto are short-termists, determinists, and with apologies, the economists”. Interestingly, in October 2014, they had presented their book at the LSE and were quite mild and bland about economists when a member of the audience inquired. Hmmm, I wonder what changed between October and November ? Deborah Cohen and Peter Mandler, historians at Northwestern and Cambridge respectively, have penned a scathing review of The History Manifesto, which is scheduled to appear in the February 2015 issue of The American Historical Review. They agree (on page 16 of the preprint) with my comments on the book’s treatment of Joel Mokyr, Paul Johnson, and Stephen Nicholas. In an earlier blogpost I discussed whether slave cotton was necessary to British industrialisation in reaction to the claim made by Edward Baptist. Bradley Hansen addresses Baptist’s other claim, about how important slavery was to American economic development. See also his Back of Ed Baptist’s Envelope. In Mexico in the late 19th century, Javier Arnaut finds internal divergence in regional wages and attributes it to the lack of labour mobility, itself due to debt peonage systems of labour in the centre and south of the country. Institutional wage repression is also illustrated by Kevin Bryan blogging a paper by Dippel, Greif, & Trefler. When cane sugar prices collapsed in the 19th century after the introduction of beet sugar, wages fell in some Caribbean sugar colonies, as expected, but rose in others. Earlier, following the abolition of slavery, the island planters had resorted to bonded labour. It turns out, the islands where wages rose were the ones least suited agronomically to sugar cultivation, and the marginal planters quit after the sugar depression. The blog A Fine Theorem overall is highly recommended as he often blogs on economic history, particularly from a theoretical perspective. Speaking of extractive institutions, I really dislike the Acemoglu-Robinson “reversal of fortune” paper. I stated my reasons here, which agree with Joe Francis that high population density in 1500 implied low incomes, the opposite of the peculiar and unconventional stance taken by Acemoglu and Robinson. Francis, a specialist in Argentine economic history, is not a prolific blogger but most of his posts are interesting and derive in one way or another from his PhD dissertation at LSE. I particularly recommend those on “Mickey Mouse Numbers“; a critique (and follow-up) of Jeffrey Williamson’s Trade and Poverty: When the Third World Fell Behind (which I really like); and (though a bit obscure for those without interest in Argentina) the “Halperín Paradox“. Francis approaches most of these topics from a data quality angle. And the piece with the widest potential appeal is the one where he asserts “Argentina’s apparent decline is…an illusion created by faulty GDP statistics“. That flies in the face of the conventional wisdom about the well-known “century-long decline of Argentina“, standard treatments of which include this and, more recently, this. Noah Smith argues in his Bloomberg column that contrary to stereotype, Japan is a fractious polity which hides its inability to enact needed policies by presenting the image of harmonious consensus to the world. That’s hardly news, but the interesting part is his initial metaphor — the chaos of Japanese decision-making during the Second World War. A good background is Jacob Schlesinger’s Shadow Shoguns, the portrait of Japan’s post-war political machine run by the Liberal Democratic Party. The LDP is actually a loose coalition of parties, not a party in the ordinary sense. 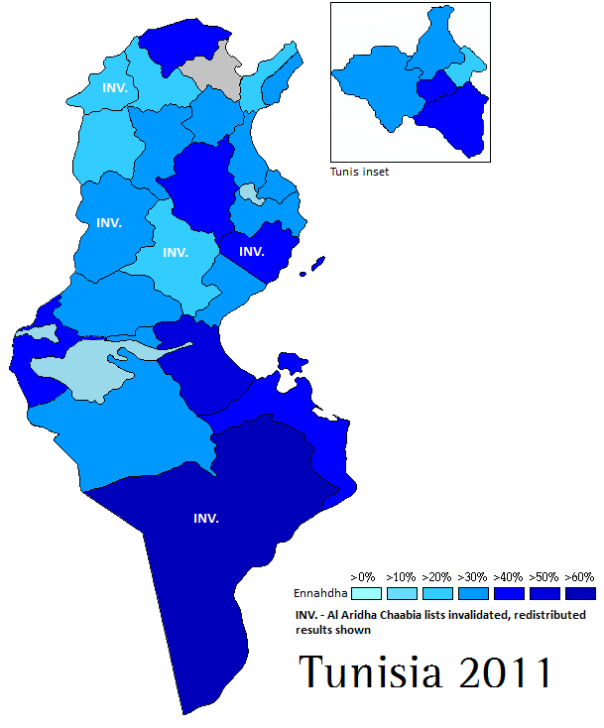 Benjamin Preisler, who blogs in three languages, has a good Monkey Cage explainer about the 2014 elections in Tunisia. 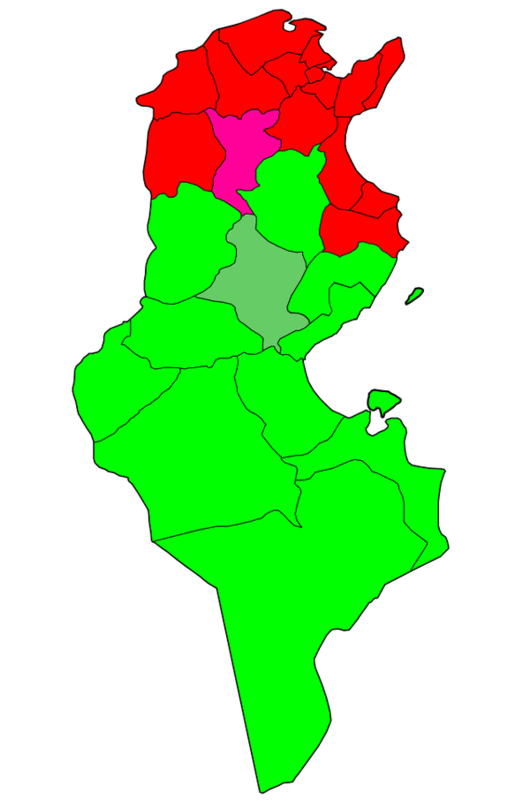 Those from the inland regions who had led the 2010 revolution lost in the recent elections to those from the wealthier coastal areas. The latter had been the primary beneficiaries (and parasitic constituents) of the ancien régime. See also the 2011 election results. Was the Arab Spring caused by volatile food prices, as some have argued ? In the general case, Marc Bellemare finds that between 1990 and 2011, high food prices, but not the volatility of prices, were associated with riots. This poses a problem for regimes who have difficulty financing food subsidies aimed at urban populations, where riots occur. A propos of bread & circuses, Frances Coppola digs up an old paper by Rudiger Dornbusch and Sebastian Edwards and situates the current ruinous state of Venezuela in the long history of Latin America’s populist policies. That paper, by the way, was turned into a very good book, The Macroeconomics of Populism in Latin America, with many country examples. If you read through everything, you will notice neither Blattman nor Jerven rates too highly the empirical “institutions” literature in economics. When you have some area and period knowledge of actual institutions, that literature will seem kind of thin. (Branko Milanovic once made an acid remark, “Acemoglu reads like Wikipedia with regressions”.) I recommend once again Dietrich Vollrath’s The Sceptic’s Guide to Institutions (in 4 parts), along with Chris Blattman’s institutions reading list, emphasising political science and history. Vollrath, the cautious empiricist, will be the first to tell you not to overread his scepticism, but everyone already agrees that “institutions” are important. The real issue is that the institutions literature is riddled with identification problems, especially the global cross-country regressions. The papers that deal with them best tend to be smaller-scale studies exploiting natural experiments (see Part 3). But those are about “persistence” just as much as about “institutions”, anyway. Beware of maps and eyeball correlations ! 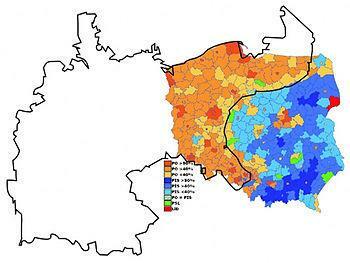 Discontinuities do exist at the 1918 Russo-German border, but only in the number of votes for post-communist parties that nationally get <20% of the vote ; and at the old Austro-Russian border, in the vote for liberals. In a discussion of interregional income inequality in the UK, Tim Worstall common-sensically points out that the gaps are exaggerated because of differences in the local cost of living. Rent is a bit steeper in London than in Lothkrackenclyde-on-the-Despond. 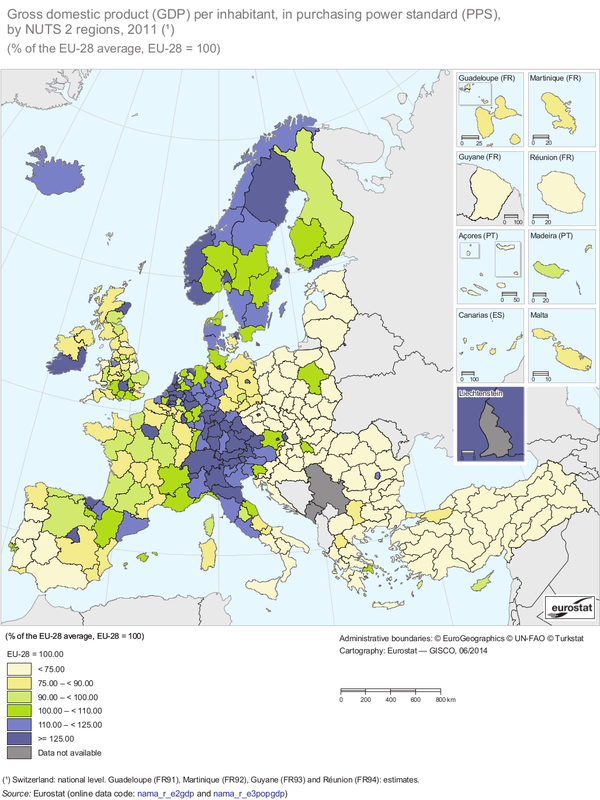 But that also means all maps like the following are misleading about the regional differences in GDP per capita, at least as measures of consumption living standards. 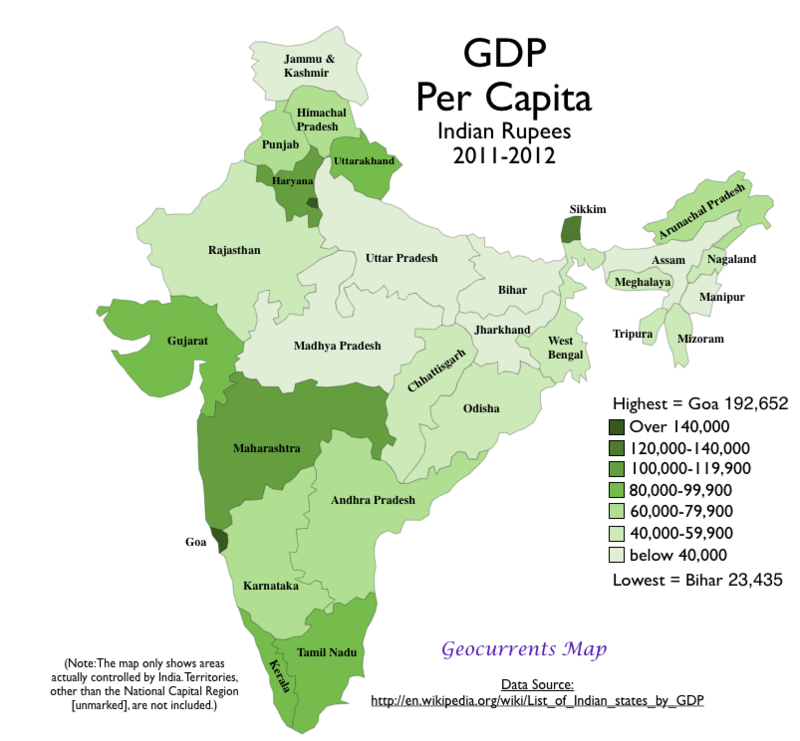 GDP in such maps is usually deflated by national, not regional, price indices. The Counterreformation had some famous economic effects. After Antwerp fell to the American-bullion-fattened armies of the Holy Roman Emperor, Protestants in Flanders were given the choice of exile or recantation. Flemish Protestants thus fled to Dutch cities (where they also found Sephardic refugees from Spain), just as they also boosted the English wool industry in Norwich. Many of the merchants in 18th century London were Huguenots. But less well known is the impact of Huguenot refugees in Prussia. There’s now a slightly middle-aged body of social science literature showing that in developing countries, heterogeneity (religious, linguistic, ethnic, etc.) is associated: (a) with higher levels of inefficient redistribution, i.e., resources from one group are diverted by politicians of another group as patronage to their own; (b) with lower levels of public goods provision at the national level (because groups don’t want to help pay for goods which other groups can also enjoy); and (c) with higher levels of regional public goods. (I think much of this literature has one big mother of an omitted variable, but I won’t get into that for now.) 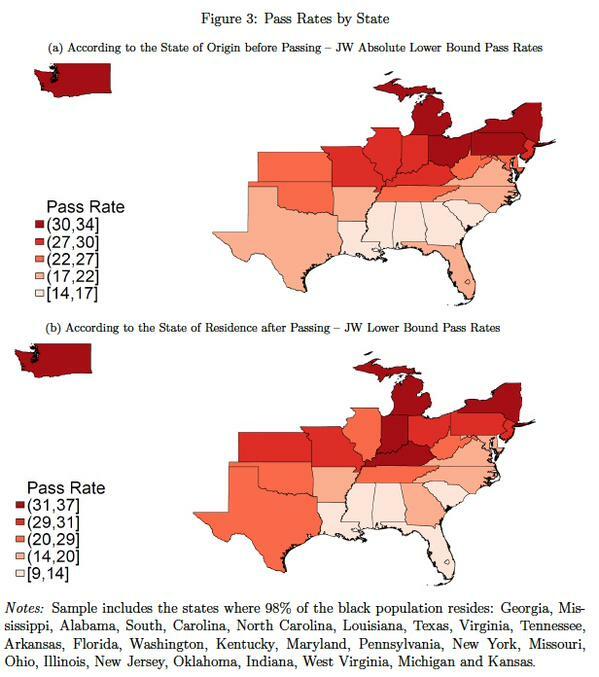 Addressing this issue of social capital Kevin Bryan has a fantastic post on a paper which uses a natural experiment with Native American reservations in the USA. 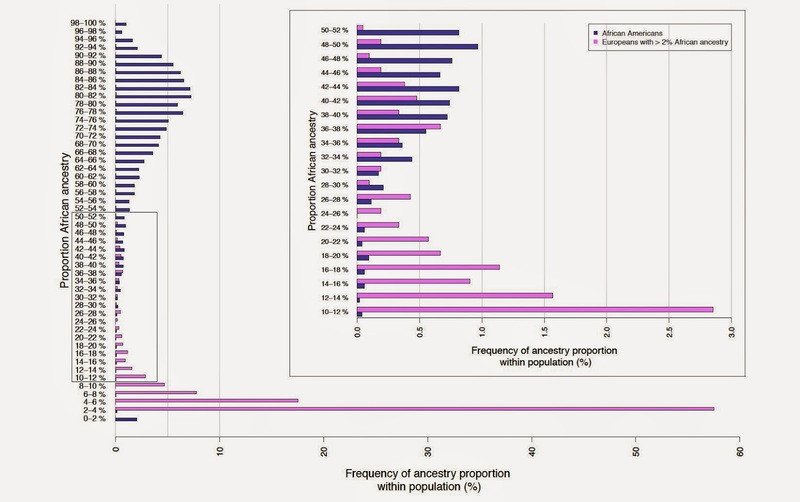 At least 19% of US census-designated blacks passed for white in 1880-1940, with approximately 10% reverting to black. The act of passing itself is not news, but I think this is the first time numbers have been estimated with an explicit methodology. You should read geneticist Razib Khan’s commentary on the paper. Also: his thoughts on the future of the racial makeup in the United States, which are well informed by history. L’Islam n’existe pas is how I would summarise, perhaps tendentiously, the position taken by Razib Khan for a long time and which I agree with enthusiastically. Only Muslims, with actual beliefs and behaviours rooted in history, exist. Scripture, doctrine, and theology are the opiate of the intellectuals, and do not explain in any fundamental way the beliefs and behaviours of ordinary people. So what “Islam really is” — or for that matter, what “Christianity really is” — should be left to the believers. Yet people, both critics and defenders, still impute an essence to religions, even though no essence can exist. Khan approaches religious behaviour and belief from an anthropological-psychological-evolutionary perspective, which is right, but one might infer the same thing from history — which seems to have determined the formation and interpretation of scripture and docrtrine, rather than the other way around. “Neither Islam nor Western foreign policy drives terrorism” (a summary title belonging to Ben Southwood, not to the author) is a fine survey of recent literature. But it’s stronger on the foreign policy part than on the latter, mostly because “Islam” is not clearly or relevantly identified. Degree of religiosity ≠ sociocultural identification as Muslim. Better-educated clerics=>less support for jihadism may be true but could be misleading, as better educated clerics also imply greater official cooptation (e.g., al-Azhar University). Besides, since when did jihadis need religious education to declare themselves competent to pass fatwas ? The post also does not address perhaps the most salient issue: why terrorists are disproportionately Muslim. A paper in Current Biology, of all places, argues that the rise of the great moralising, ascetical religions of the Axial Age — including Buddhism, Daoism, Stoicism, and Second Temple Judaism — was ironically caused by affluence. Such religions emerged in societies where energy capture exceeded 20,000 kilocalories per day. (Readers of Ian Morris will be familiar with the concept of energy capture.) Peter Turchin, evolutionary ecologist turned quantitative modeller of historical dynamics, offers a cogent critique in two parts. Turchin also spoke on BBC about the deep origins of hierarchy and inequality. Speaking of which, those interested, either in long-run inequality dynamics, or Malthusianism in general, really must read Turchin’s Secular Cycles. It wades into The Brenner Debate of the 1970s and presents a combined economic-institutional quasi-solution to the wage/population boom-and-bust cycles of the Middle Ages. Elite extraction and income inequality matter to the dynamics. In my opinion, Clark’s neo-Malthusianism in A Farewell to Alms was a step backward, as it contained purely economic logic. Clark also moved away from Malthus’s original emphasis on wages and shifted toward income as the key variable. He has occasionally hinted at income inequality as a factor (with the implication that the labour share matters more), but never really explored it. Turchin is also coming out with a book on the history of inequality dynamics in the United States. This Aeon article from 2013 gives a foretaste of it, as does the blogpost that adds some detail about that article. It’s really a very different way of looking at income & wealth inequality over time than you find in Piketty or other standard treatments. At the group-run Economic History Blog-Latin America, I idly asked the Uruguayan economic historian Javier Rodríguez Weber how Chile’s median income compared with Uruguay’s. To my surprise, he responded by writing a whole blogpost, “Tell me what quintile you belong to, and I’ll tell you how much chicken you eat” (in Spanish). 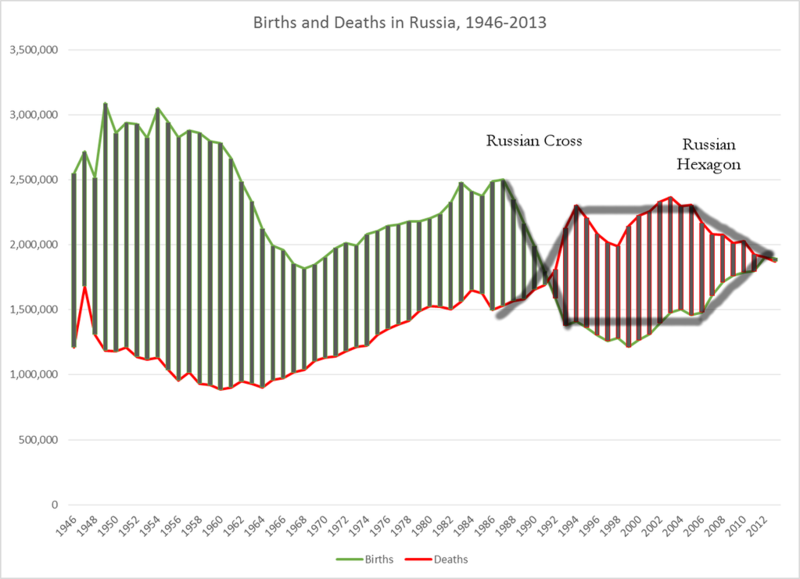 Anatoly Karlin wrote up a really fantastic correction of outdated views of Russian population issues, “The Normalisation of Russian Demography“. U.S. mortality rates fell during the worst of the Great Depression and had risen during the 1920s boom. The paper doesn’t explore the reasons, but I would guess, severe deflation implied that real wages were higher for those who remained employed. The Japanese family is at the lower bound of western norms regarding extended families, the relationship of grandparents to their adult children, etc. 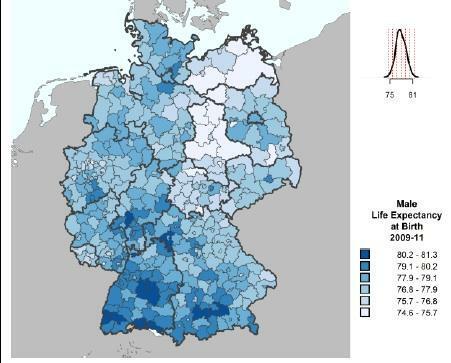 Over the course of a century the North-South disparity in German life expectancy flipped. Of course, the regional gap is smaller now than a century ago, but still it’s about 5 years, which is pretty big for developed countries. Finally, “The History of Fertility Transitions and the New Memeplex“, on the role of ideas in the demographic transition, plus a good brief history of ideas about fertility in general. Not sure what to make of it, but interesting. The Commercial Revolution. Robert Allen’s theory of the Industrial Revolution starts from the observation that England had high wages (and cheap fuel). Branko Milanovic, who really likes Allen’s theory, still wonders why England in the 18th century had higher wages than the rest of Europe in the first place. He tables a hypothesis by Mattia Fochesato : feudal institutions remained stronger in southern & eastern Europe after the Black Death than in the northwest. Milanovic does not mention hypotheses by Voigtländer & Voth. 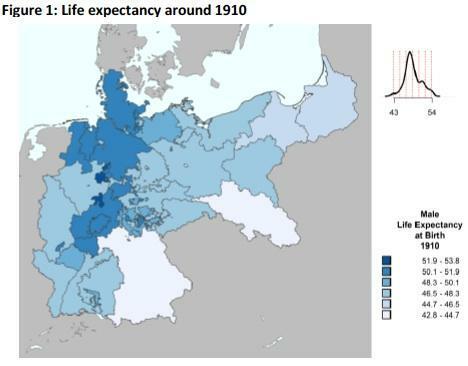 After the Black Death, a virtuous-vicious cycle of increasing urbanisation and elevated mortality due to diseases & wars checked population growth more in the Northwest than elsewhere in Europe (Malthus’s “positive check”). And there was more fertility restriction via higher age of first marriage (Malthus’s “preventive check”). None of these is mutually inconsistent. Allen aired his own theory in his book : a virtuous cycle of urbanisation, agricultural productivity growth, international trade, and “proto-industrialisation”. The last is primarily about the shift of wool textiles production away from northern Italy to England and the Low Countries. Allen says one reason for the shift was that the staple length of English wool increased, compared with that of Mediterranean sheep. Northern sheep were better fed than southern sheep for the same reason people were better fed after the Black Death. But I wonder if deliberate sheep breeding at the time of the Little Ice Age did not play a role ? Anton Howes, there is much more room for British ingenuity. 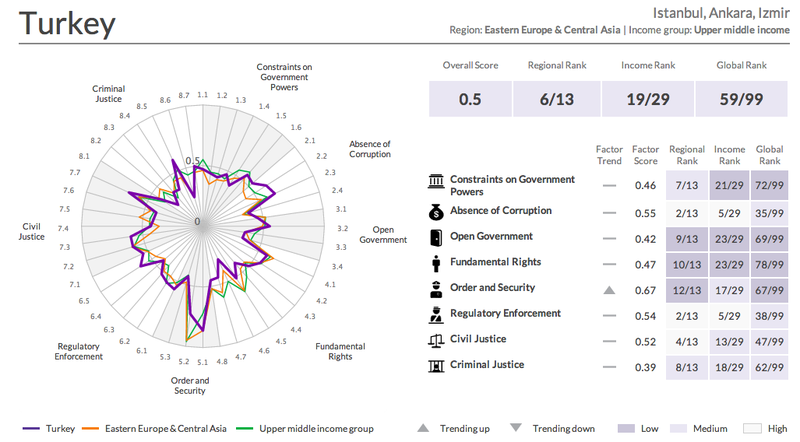 I’ve not had the opportunity to take a close look at the working paper Unified China, Divided Europe, but the literature survey, the data visualisation, and the topic alone make it worth reading. “How Agricultural Science Struggled to Defuse the Population Bomb“, via Matthew Holmes, historian & philospher of science with an environmental and agricultural focus, which itself is kind of fascinating. From T. Greer: The “Kremlinology” of Chinese economic reform. (I don’t agree that what ever kind of financial adjustment happens China would be left in a Japan-like lost decade of stagnation.) A Short History of Han-Xiongnu Relations and its followup, plus Every book read by T. Greer in 2014. If you’re a fan of Alex Mesoudi, there’s an excellent précis of cultural evolution theory. (Link thanks to T. Greer and Razib Khan.) Faster than Fisher, arguing from a simple population-genetics model why the spread of lactose tolerance had to be by natural selection. Crops & cousin marriage in France. By “boiling off” the less-Amish, the Amish become ever more and more Amish. Via Emil Kierkegaard, the International General Socioeconomic Factor (“s”, in analogy with “g”). The American Historical Review had a special issue on “History & Biology“, though I think the only ones worth reading are the entries by Harper and Scheidel. From Ben Southwood, the jolly libertarian shock trooper at the Adam Smith Institute: The “Genetics of Political Views” is a neat digest of a survey of the literature on the biological roots of political orientation. Another post, “Why does the son rise?” comments on some of the literature on whether positive financial shocks (aka “luck”) have a persistent effect on economic outcomes, including my favourite, the natural experiment supplied by the Cherokee Land Lottery. I scoff at the idea that “per capita innovations” is a meaningful metric of any damned thing, but “Are we innovating less?” contains a variety of references worth reading. Anton Howes has questions about the Ming dynasty. Does it really bloody matter, protectionism or free trade ? (It’s a little overstated, because terms of trade matter. Plus Howes is waaaaay too nice with Ha-Joon Chang. But it’s a salutary corrective, since there is an overemphasis on trade amongst both free-marketers and left-wingers.) Immigration and the Industrial Revolution. Howes, why no Flamos and Huguenots ? When exactly did the Industrial Revolution start ? (I agreed with this when he first posted it, but now I disagree.) Hey, silly physicist, you can’t touch most of GDP. If you go to amazon.com, you’ll see that people buy together (1) G.E.M. de Ste. Croix, The Class Struggle in the Ancient Greek World and (2) Ellen Meiksins Wood, Peasant-Citizen and Slave. “Neither Islam nor Western foreign policy drives terrorism”… is a fine survey of recent literature. But what about the recent recent literature? PE, how well-supported is Stanley Lebergott’s old claim that real wages, for America’s non-farm workers, barely budged in the first two-thirds of the nineteenth century? Never heard that before. But there is a whole book devoted to that very subject (antebellum American wages) reviewing all previous estimates and containing new ones: Wages and Labor Markets in the United States, 1820-1860. Upshot: there were long periods of stagnation followed by bursts of increase, but real wages in 1860 were around double those in 1820. Piketty in his book mentions something called Engels’ Pause, a term he uses to describe a similar wage stagnation that he says took place in the early-nineteenth century British and French economies. The most important case , which I discussed briefly in the Introduction, is no doubt the increase in capital’s share of income during the early phases of the Industrial Revolution, from 1800 to 1860. In Britain, for which we have the most complete data, the available historical studies, in particular those of Robert Allen (who gave the name “Engels’ pause ” to the long stagnation of wages), suggest that capital’s share increased by something like 10 percent of national income, from 35– 40 percent in the late eighteenth and early nineteenth centuries to around 45– 50 percent in the middle of the nineteenth century, when Marx wrote The Communist Manifesto and set to work on Capital…. Available historical data for France suggest a similar chronology. In particular, all the sources indicate a serious stagnation of wages in the period 1810–1850 despite robust industrial growth. Piketty, on the other hand, seems to view the early American Republic, at least until the second half of the 19th century, as sort of an idyllic period where capital could gain no advantage over labor because of all the surplus land. As far as I can tell, he doesn’t mention wage stagnation for the early nineteenth century American economy, and it seems, given the subject matter of his book, that he would do more than mention it if he believed it took place. I find all this stunning. How is it possible that any economists would take seriously the proposition that wages were stagnant for half a century in the early industrial period? Is the evidence for it that clear? I could understand a ten to twenty year-period of stagnation, but fifty years of unprecedented productivity gains having little to no effect on wages? That’s stunning. What am I missing? Piketty does not mention that British wages in the first industrial revolution period are controversial, divided into “optimist” and “pessimist” camps. Gregory Clark has a chapter in The Cambridge Economic History of Modern Britain assessing the two sides. There’s also the tricky question of constructing price deflators to get estimates of real wages. In 1780s-1850s, according to Feinstein, real wages grew by ~15%. Most people who take the pessimist side also reference the height evidence, which showed no improvement. Output per worker rose about 50% in the same period. Pseudo: Very glad that Cohen and Mandler picked up your observations on The History Manifesto. It occurs to me that the whole debate has ignored the most glaring 21st century example of a long-term historian “speaking truth to power”, that of Bernard Lewis, who provided a great deal of cover for the US invasion of Iraq and who still sees Iraqi “democracy” as an outcome that justifies the war. To me the example begs the whole question of scholarly social engagement: “power” is always going to listen to the experts whose counsel matches what power wants to do. This, after all, is what think tanks are for. The only way to “speak to” power is from outside the system and, on the outside, historians are on exactly the same footing as everybody else. If you ignore what the authors said about them, the footnotes were the best part of the History Manifesto. The groups of citations on sustainability, anarchism, and social protest history contained very good leads for exploring these topics. Of course, so did the economic history citations, although it’s clear the authors never did more than scan these books. Somebody told them that Bob Allen used the word “counterfactual” – and that was all they needed!